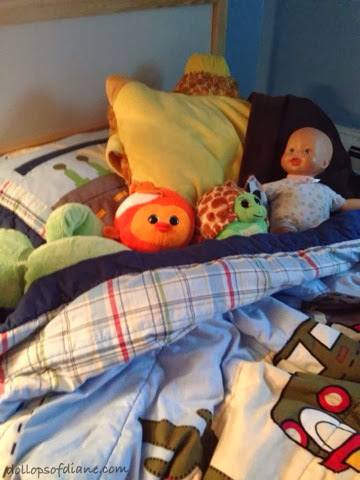 Daniel recently moved from his crib to a new big boy bed. He's been doing great in it and hasn't gotten out of bed at all during the night. As if moving to a new bunk bed isn't exciting enough, he's also pumped that he now gets to participate in chores and get an allowance. Each morning the kids are responsible for making their beds. Sunday is pay day when they earn their whopping quarter for a hard week's work. Yup, twenty five cents is the going rate for bed making in this house. Isabelle is also in charge of organizing the shoes by the door each night. For that task she rakes in an extra dime on top of the quarter. That's how we roll here - train them young and train them cheap. Just think how excited they'll be to earn minimum wage someday!